I was recently speaking with a friend about investments. At one point, he disclosed he didn’t have much liquidity. When I asked why, he said it was because he invested several million dollars in McLarens and Patek Philippe watches. I thought he was kidding, but he was totally serious. Yet after we talked more, and I did a little research, I gained a greater appreciation for the role hard assets play in certain folks’ portfolios. Most people associate investing with traditional asset classes like stocks and bonds. “Things” are not typically viewed as investments. Particularly luxury items, like a McLaren supercar. 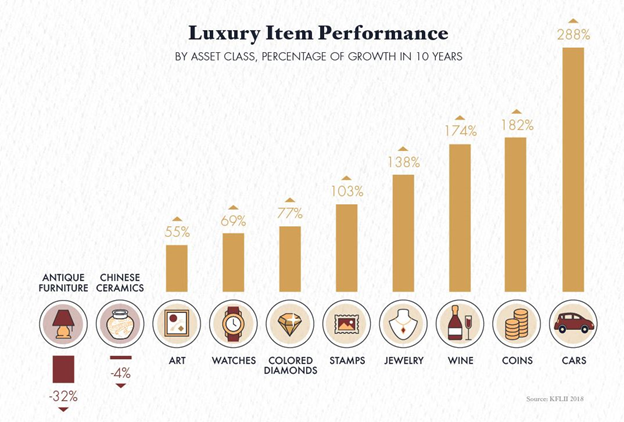 Here’s a look at how various items performed over the last decade (source: Visual Capitalist). Cars did best. In their paper, Credit Suisse uses the term “treasure assets” to describe investments of passion. These can include a range of beautiful and rare items, typically favored by the ultra-wealthy. If chosen wisely, such assets may provide both a status symbol and a mechanism to preserve wealth. Examples of treasure assets include fine wine, art, rare coins, certain types of jewelry, and high-end automobiles. Treasure assets often pay nothing other than an emotional dividend up until the point of sale. There are no cash flows to discount. These assets are worth whatever someone is willing to pay for them. Two factors seem to drive value in this domain. First, supply is often scarce. Second, many of the buyers are so wealthy that the items they bid on are price inelastic. Look no further than the appreciation rate of sports franchises in recent decades. These qualify as private-market treasure assets. A few years back, former Microsoft CEO, Steve Ballmer, raised eyebrows when he bought the NBA’s Los Angeles Clippers franchise for $2.15 billion. That remains near the highest sum ever paid for a sports team. And let’s face it, the Clippers aren’t the most storied franchise in terms of their win-loss record! But if you’re worth $45 billion like Steve Ballmer is, does it really matter if you pay $1 billion, $2 billion or even $3 billion? The bottom-line is: if you’re mega rich and want something, you can have it. And maybe the $2 billion Ballmer paid wasn’t even as outrageous as it first appeared. Circling back to McLarens, luxury supercars are not like the average vehicle that depreciates the moment it leaves a car lot. Gordon Murray originally designed the McLaren F1 to be the ultimate driver’s car. Brand new, an F1 typically costs around $1 million. As the years go by, however, the cars can mightily appreciate. For example, at a 2017 Quail Auction, a 1995 F1 fetched a record $15,620,000. Before receiving that check, the owner had the car for 22 years. They put just 10,000 miles on the odometer, mainly owing to a cross-European road trip shortly after buying the car. So, let’s estimate the ROI on that. A 15x return over just 22 years. Plus, the road trip of a lifetime. I don’t know about you, but I’ll take that memory and return all day long! Per the Credit Suisse report, privately held assets—including collectibles and real estate—comprise about 40% of global investors’ portfolios. In the U.S., such assets represent only 23% of net wealth. Considering how low bond yields are now, U.S. investors may want to try to think more creatively about their asset allocation. Not everyone has the means to drop a million bucks on a car that will mostly sit in a garage. There are plenty of other options, though, including: precious metals, art, coins, and even rare books. I became more of a believer in what my buddy was doing after he explained the depth of his passion. The guy is no novice collector. He’s an expert. And his specialized knowledge gives him a moneymaking edge when he heads to an auction. My friend is diversified. He owns stocks, bonds, and real estate. When choosing traditional investments, he analyzes yields and risk profiles. When it comes to the hard asset sleeve of his portfolio, however, he looks at different criteria. Someone he considers a mentor, whom he originally met at a McLaren Club event, taught him to focus on investing in things he likes. As a money manager, I can see utility in “liking an investment.” It may spark curiosity to do more upfront research and help stick with an investment to realize the long-term reward. Michael Cannivet is the founder, portfolio manager and President of Silverlight Asset Management, an investment advisory firm serving high net worth private clients.